This is one of my absolute favorite bath therapies. It is the first thing we do for our own family whenever we feel we are developing a cold or illness. Not only does it detoxify the body and relieve pain, but it seems to also stop many infections quickly and help the body regain balance. Through medical studies, this therapy has been shown to relieve pain that did not even respond to narcotic medicines. This and all bath therapies work best by first dry skin brushing the entire body (see Chapter 15, Dry Skin Brushing). This removes the layer of dead skin that may otherwise block the absorption of energy and nutrients from this bath and stimulates the blood and lymph fluids to rise to the skin to accept the healing effects of the bath. Fill tub with warm water. Add the above ingredients. Soak for at least 20 minutes. The beneficial effects of this bath are cumulative and increase in effectiveness the more you use them. Recommended taken for at least seven consecutive days, or as recommended by yourdoctor. Continued use daily, or as needed, is fine. Hydrogen Peroxide – a simple, nontoxic molecule of H2O2 that is beneficial in oxidizing (breaking down) toxins as well as killing anaerobic microbes. It will also detoxify pesticides and petroleum-based toxins and oxidize metals. Hydrogen peroxide is also naturally produced by macrophages in the body to kill harmful bacteria. Most harmful bacteria are anaerobic and cannot survive in the presence of oxygen or hydrogen peroxide. Cancer cells are often very sensitive to increases in oxygen and cannot survive in oxygen-rich environments. When hydrogen peroxide is applied topically to a cut, the resulting bubbling is from the rapid release of free oxygen and, more importantly, from the killing of the bacteria in the cut. Friendly bacteria are aerobic and need and thrive on oxygen. Epsom Salts (Magnesium Sulfate) – Recent research has shown that when one soaks in a bath of magnesium sulfate, both magnesium and the sulfate independently increase measurably in the blood and urine. Magnesium sulfate helps stabilize Hydrogen Peroxide so that its ultimate breakdown into H2O and free oxygen is more gradual and functional to the process of benefiting the body. 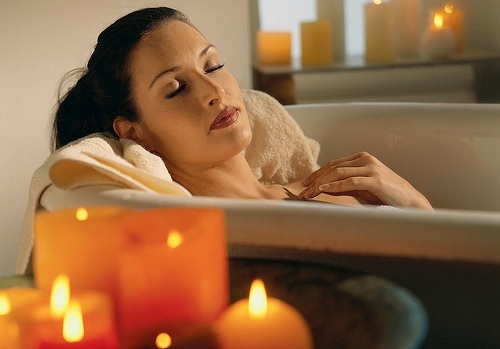 This research documents the very real beneficial aspects of this bath therapy. The Epsom Salt Council reports the following about the benefits of Magnesium in Epsom Salt baths. Magnesium, a major component of Epsom Salt (magnesium sulfate), is the second-most abundant element in human cells and the fourth-most important positively charged ion in the body. Magnesium also helps to regulate the activity of more than 325 enzymes and performs a vital role in orchestrating many bodily functions, from muscle control and electrical impulses to energy production and the elimination of harmful toxins. The National Academy of Sciences, however, reports that most Americans are magnesium deficient, which may account for our society's high rate of heart disease, stroke, osteoporosis, arthritis and joint pain, digestive maladies and stress-related illnesses, chronic fatigue and a host of other ailments. The Academy estimates the average American male gets just 80% of the magnesium required for good health, while females get only 70% of their recommended levels. Nutritionists say Americans' magnesium levels have dropped more than 50% in the past century. Improve heart and circulatory health, reducing irregular heartbeats, preventing hardening of the arteries, reducing blood clots, and lowering blood pressure. Oral supplementation of Sulfate cannot be easily absorbed across the gut walls; therefore, by soaking in this bath, sulfate can be more efficiently supplemented. Sulfate is essential for many biological processes. Sulfate in necessary for sulfation, a major pathway in detoxifying drugs and endogenous (toxins from within the body) or exogenous (environmental) toxins. Sulfate is necessary for the repair and formation of brain tissue. Reduced levels of sulfate can lead to faulty neurological connections and subsequent dysfunction. Sulfate is needed for proper digestion and for proper utilization of digestive enzymes. Sulfate is essential for the production of mucin, a protein which lines the intestines. Mucin stops food and drugs from sticking to the lining of the intestines. It also blocks the transport of toxins from the gut into the bloodstream. Ginger - functions to open up the pores of the skin and increase the blood flow at the surface of the skin, so that the oxygen from the hydrogen peroxide can do its work in detoxifying poisons and kill bacteria and fungi. The pores open wider so that the magnesium sulfate can be more readily absorbed. Ginger is invigorating and can stimulate perspiration for the elimination of toxins. i Waring, R. Sulfate and Sulfation, School of Biosciences, University of Birmingham, United Kingdom. ii Emery, P., Bradley, H., Gough, A., et al. Increased prevalence of poor sulphoxidation in patients with rheumatoid arthritis. Ann. Rheum. Dis. iii Bradley, H., Gough, A., Sokhi, R. Sulfate metabolism is abnormal in patients with rheumatoid arthritis. J Rheumatol 21(7)1192-1196.